Background: Abdominal obesity in adolescents has been identified as a risk factor for occurrence of cardiovascular and metabolic diseases. Objective: To monitor abdominal obesity in Roman adolescents through a five years-period. Method: A total of 410 adolescents aged 14.5-17.9 years, living in the city of Rome, were selected from two cross-sectional studies conducted during 2006-2007 (HELENA Study) (n=198) and 2011-2012 (ALIADO Study) (n=212). Anthropometric measurements such as weight, height and Waist Circumference (WC) were taken in both surveys using the same methodology and trained staff. Overweight and obesity were defined by both the latest IOTF (International Obesity Task Force) and WHO (World Health Organization) references, abdominal obesity as a Waist-to-Height Ratio (WtHR) ≥0.5. Smoking data were collected by questionnaire and socio-economic status was assessed using the education level of both parents. Results: A significant decrease in the mean value of WC in males (p=0.001) and of WtHR in females (p=0.002) was observed from 2006-2007 to 2011-2012. A decrease of abdominal obesity proportion was observed in female. 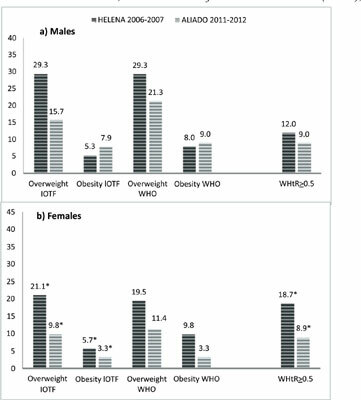 Lower proportions of overweight and obese females were observed in 2011-12 than in 2006-07 using both criteria, IOTF and WHO. It was not found that smokers were more likely to have abdominal obesity. Conclusion: There is a decrease of abdominal obesity and a significant trend towards lower WtHR values in female adolescents from Rome (Italy). In males, despite a trend towards lower waist circumference values, the prevalence of abdominal obesity leveled- off. Abdominal, adolescence, gender, obesity, smokers, trend.